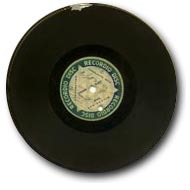 78rpm-recording on a "wax" disc. Through the years the coating has become brittle and is peeling. The blank discs were manufactured by Wilcox-Gay of Charlotte, Michigan during the 1940's. Popularly called "wax" discs, they were also known as acetates. These discs consisted of an aluminum metal base, coated with black lacquer. The recording stylus would etch (cut) the groove into the lacquer while recording. I grew up as a first generation, American born child of an Italian immigrant family. My grandfather, Giuseppe Adamo, was responsible for making that first trip (c 1902), as well as subsequent trips and for paving the way for many people to come to the "new" country to get a fresh start. Besides his strong devotion to family, he also had an unrelenting passion for music, which he managed to somehow nurture in spite of all of the demands and obstacles that providence had placed in his path. I was born in 1956, many years after he had created the bulk of his work. I was 5 years old when he died in 1963 and I don't remember him at all. From what I have seen and heard, it appears that in many ways he was a "techie" for his times and he certainly would've utilized today's technology to create his music. In the 40's and 50's, he made home recordings on "wax" discs, but with age they became so brittle that they disintegrated and deteriorated completely. A few years ago, my mother showed me some of the sheet music that she had retained from my grandfather's repertoire. Though I am a somewhat accomplished musician, I didn't want to play them. I really just wanted to hear what those songs sounded like, in some kind of coherent manner and maybe with a few modern enhancements to put them into my own context. I started transposing the sheet music directly into various music programs that I had acquired. After painstakingly entering each individual note into the computer as written and sometimes having to do some math in order to make the time signatures match the notes, I pressed the "play" button and voilà there it was: "Digital Grandpa!" In putting this site together I needed some information to create a sense of the man whom I didn't know, and his times, so I asked my mother, Antonietta (Adamo) Gigliotti, to help me create a short biography about her father. Though he was a very strict man and very demanding, she has always maintained a respect for his accomplishments and what he had to sacrifice in order to make a better life for so many. My uncle, Major Nicola Adamo (ret.Bandmaster Director US Army) also helped with information and also provided materials for the section concerning Giuseppe's award winning "President's March". That section of the site contains an audio file of the piece recorded in 1955 by an "all star" Navy Band featuring alto trumpets -- Major Nicola Adamo conducted. Some of the themes that come out of the music are quite amazing, ranging from traditional Italian, to the themes that powered the Fellini genre, to what I can only characterize as the American West. 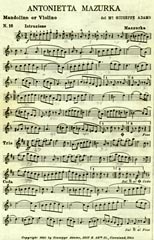 True, I did take some liberty with instrumentation and some of the accompaniment that might have been unavailable, but the main body of the melody, existing accompaniment, beat and rhythm are as close to what was written as possible. I now invite you to please sample the pieces that are in this site and drop me a line about this concept.